Plantar fasciitis is a very common condition that affects the foot and is the reason for most orthopaedic complaints. The condition can e described as the thickening or inflammation of the plantar fascia ligament which stretches across the sole of the foot (from the heel to the toes). As the majority of people walk across their lifetime, the foot region experiences general wear and tear and the plantar fascia acts as a cushion supporting the arch of the foot. When the foot experiences too much pressure, the plantar fascia can become damaged and inflamed causing pain and stiffness. This condition is usually characterised by a mild, gradual pain at the bottom of the foot usually near the heel (which can sometimes be misdiagnosed as a heel spur) and might then radiate through to the centre of the foot sole. The pain is usually most prominent during the morning as the plantar fascia has been relaxed during the night, but is then suddenly utilised again when getting up. As the plantar fascia stretches out and warms up the pain then usually lessens. Plantar fasciitis usually occurs as a result of repetitive over-extension of the plantar fascia. It can therefore be referred to as a overuse injury. 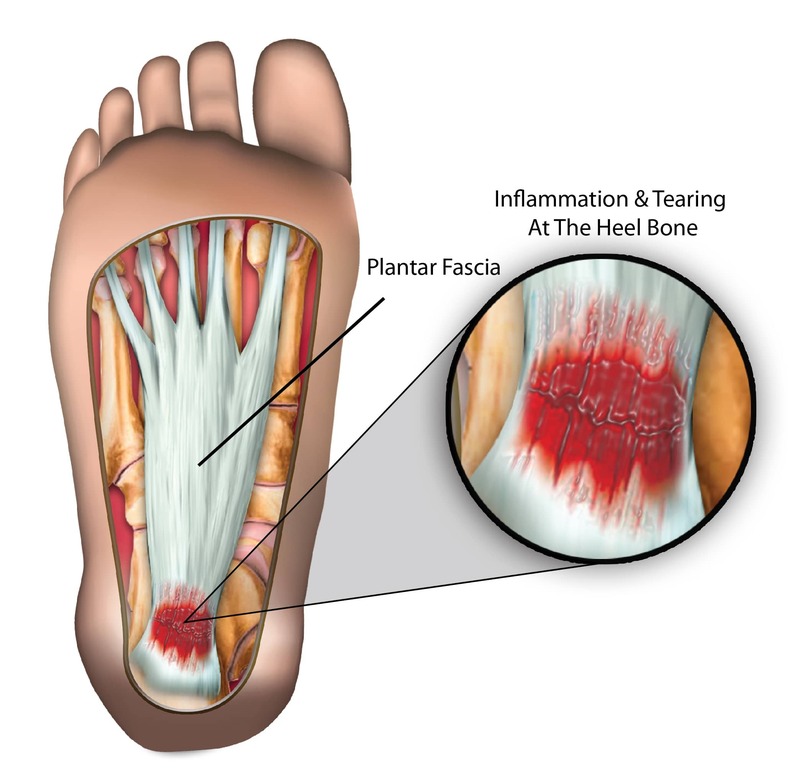 Although traditionally it is thought that the condition causes inflammation, it has been found that due to the absences of inflammatory cells present in the fascia, the condition occurs most likely due to degeneration or tearing of the plantar fascia. Although men can develop plantar fasciitis, it is said to be more prominent in women. You are also more likely to develop it as you become older. Range of motion – this is carried out in order for doctor to know how limited the motion of the foot from the ankle is and at which point the pain begins or stops. Particular focus is placed on the dorsiflexon (pointing the toes upwards), as failure to be able to do so may indicate tightness around the calf muscles and heel. Pain and inflammation – a closer inspection of the sole of the feet is carried out, and is felt (palpated) to confirm where the pain epicentre is and possibly any soreness of the area. Treatment for this condition normally involves the combination of various pain relief methods, light stretching and reconditioning of the plantar fascia until full healing is achieved. Combining these effectively is usually the best approach in treating plantar fasciitis. In order to reduce any pain and prevent further degradation or inflammation, it is recommended to adopt the R.I.C.E (Rest, ice, compress, elevate) principle as with most injuries involving the muscles or tissues. Ice should be wrapped in a towel or cloth and applied to the area causing pain for between 10-15mins every few hours. Cold packs and hot packs can also provide a similar benefit. Pain killers – over the counter treatments and NSAIDs (anti-inflammatory medication) are useful in decreasing pain and inflammation. Shockwave therapy – normally used if there Is consistent pain for over 4-6months, wherein a high intensity wave is released to aid healing of the area. Steroidal injections – an anti-inflammatory injection is applied directly to the site of the pain which may temporarily provide relief around the heel and sole. This method though should be limited in its use.